Math PLAY – Bean Sticks! Bean Sticks are simple to make, frugal, and oh so much fun! A bean stick is simply a Popsicle stick with 10 beans glued to it! Easy right? I love frugal teaching tools! When making this set I decided to use tongue depressors with lima beans that I had spray painted green. I like to spray paint the beans outdoors at least a week or so ahead of making them, this way the smell dissipates. To attach the beans I used white Elmer’s glue. Hot glue would likely make a stronger hold but I wanted to do this project WITH the children, not FOR them. When children are engaged in making their own learning materials they have a greater sense of ownership and pride in them. We will be using the bean sticks for counting, place value, adding & subtracting groups of ten, and skip counting by ten. 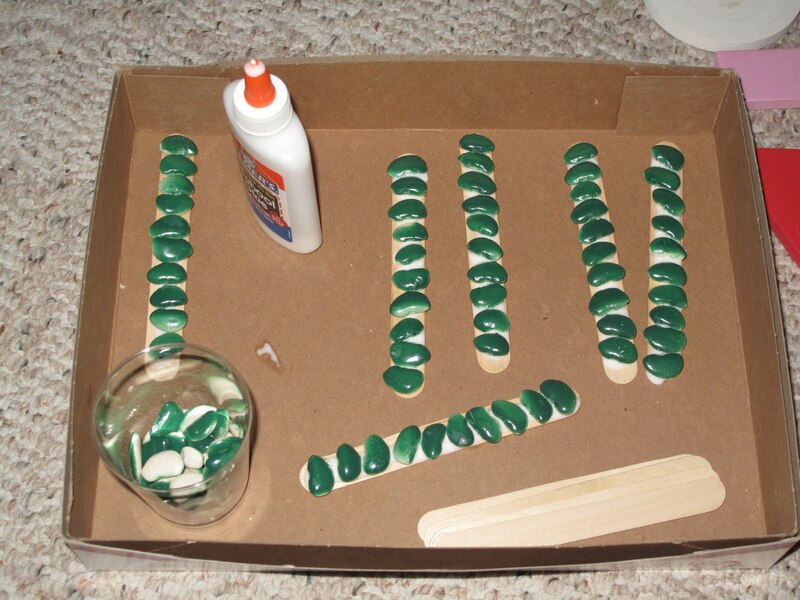 Extra beans that are spray painted on just one side will also be used as individual counters. We’ve been using these this past year to play a fun game called “bean toss addition”. Food education ~ many educators choose NOT to use food as play materials and I respect that choice. For me, I use a small amount of food for play and use it as a time to talk about where this crop comes from. Many children dislike beans but after having a Bean Taste test or making a crock pot of homemade Maple Baked Beans they often change their minds! If you are looking for more ideas on using your bean sticks check out “Count Your Beans” mat that Fran over at Kindergarten Crayons has posted. If you are looking for math activity ideas check out the website, Math at Home, which focuses on teaching early math skids for children birth -five! I love how they focus on no or low cost materials! Oh, how I love pinecones. I usually have a basket of pinecones in my classroom science center and the children love to create “forests” with them. Often the toy moose and bear find their way over the to play amongst the trees, and many other little play scenarios take shape. What I love most is how this simple collection of pinecones inspires math conversations. Sorting and classifying is always great fun. These wooden crate from Melissa and Doug toys are great to for sorting (and storing). I love using the grape vine wreath as a focal point for math conversations and the children come up with imaginative ways to play with it in their forest stories. Teaching seriation and measurement is great fun when you have a few ginormous pinecones like this one! Though we mostly use pinecones we have gathered around the school, I do bring in a few others to compare and contrast. I think it’s empowering to use natural materials in our classrooms. Children find a connection to nature and begin to see beyond the plastic and noisy toys that fill many of our shelves. How do you use pinecones in your classroom? Any tips for using sticky pinecones? !